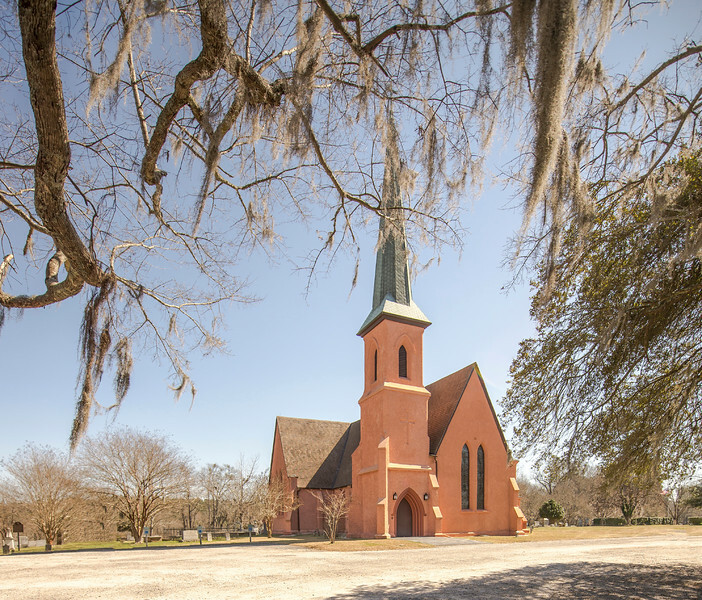 South Carolina Archives and History: (Holy Cross Episcopal Church) Built in 1850, Holy Cross is of Gothic Revival design and is constructed of yellow pise de terre (rammed earth). Walls constructed of pise de terre (minimum depth of 13 inches) are almost impervious to earthquakes. Edward C. Jones of Charleston, designer of Holy Cross, was one of the best known South Carolina architects of the antebellum era. The cruciform Holy Cross is considered one of Jones’s most unusual designs. It resembles an Old World Parish Church. The high-pitched roof is of red tile. The interior features Bohemian stained glass windows designed by Violett de Duc and a rare Henry Irwin organ. Holy Cross is significant in that it, along with various other structures in Stateburg, comprises the largest complex of pise de terre buildings in the United States. Buried in the graveyard of Holy Cross is Joel R. Poinsett, a U.S. Congressman, Minister to Mexico, Secretary of War, and first president of the forerunner of the Smithsonian Institution, who is best remembered for bringing the poinsettia flower to this country from Mexico. Listed in the National Register November 7, 1973; Designated a National Historic Landmark November 7, 1973.